Borealis and Borouge, leading suppliers of innovative and value-creating plastics solutions, will put their lightweight and globalisation capabilities in the spotlight at the IZB 2012 fair from October 10-12 in Wolfsburg, Germany. Highlights will include their on-going efforts to support the automotive industry in addressing customer-specific and environment-related challenges. Visitors to Borealis and Borouge’s stand will experience the latest developments offering the maximum in mechanical performance in combination with minimum weight and cost-efficiency. Borealis and Borouge offer polyolefin-based (PO-based) innovations that embrace more sustainable manufacturing for Tier One suppliers and original equipment manufacturers (OEMs). This is achieved through high-performance and greater cost-efficiency while still meeting requirements for high quality aesthetics in vehicle interiors and exteriors and by offering vehicle weight savings when used to replace traditional part materials. The companies provide the same material-quality produced with the same production technology to customers around the world including growing regions in South America such as Argentina and Brazil, the partner countries in focus at this year’s fair. • Volkswagen (VW) Golf A7 instrument panel carrier – Borealis’ short glass fibre reinforced polypropylene (PP) GE277AI enables weight reduction in combination with cost-efficiency. The material design supports reduced wall-thickness in combination with foaming technology for high level mechanical performance and a lighter weight component. 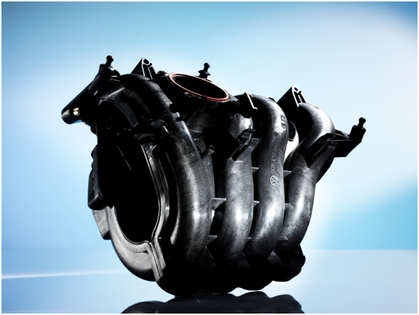 • Glass-reinforced PP Air Intake Manifold (AIM) – PP has become the standard-material for non-charged engines in the VW group formerly made from polyamide. Borealis and Borouge are pioneers for the material paradigm shift with Xmod™ GB306SAF, a high performance 36% glass fibre reinforced compound. Xmod GB306SAF received the Frost & Sullivan 2010 Global New Product Innovation Award in the “Automotive under the Hood Plastics” category. These product highlights will be exhibited alongside further state of the art solutions in interior, exterior and under-the-bonnet applications for recent models of the VW Group including VW Up! door claddings, the Skoda Superb bumper and Audi A3 under-body shielding. New grades from Borealis’ Xmod and Nepol™ portfolio of short-glass fibre and long-glass fibre reinforced PP have a much lower density than polyamide (PA), allowing for considerable weight reductions of up to 15% per application. Additionally, overall production costs were reduced through approximately 20% lower energy consumption, more flexible production parameters and the elimination of manufacturing steps. The co-operation strategy with VW is part of Borealis and Borouge’s on-going steps towards offering true global support to its customers. At IZB 2012, Borealis and Borouge will demonstrate how a worldwide product nomenclature and global network of production and support facilities in emerging automotive markets such as Brazil are contributing to constant and consistent material supply and technical service to different parts of the world. Borealis has been operating PP compound production sites in Brazil for more than five years in Itatiba and Triunfo. Both locations are in close proximity to the major automotive sector bases of São Paulo and Porto Alegre.